In this step, you'll make the graffiti project interactive by enabling the user to choose where to paint his or her masterpiece. From the control menu, choose an if/then block. The top of the block has a space for the condition or the thing that is being tested. For this project, the user will paint if the mouse button is pressed down. So, mouse down is the condition for this if/else block. From the sensing menu, drag the mouse down block into the condition. To make the spray paint sprite stamp only if the mouse is down, place the if block around the go to mouse pointer and stamp block. If the mouse button is pressed down, the spray paint sprite stamps. If the mouse button is not pressed down, nothing happens. Add a clear block to the beginning of your block stack to clear the stage. Finally, add a when green flag clicked block. If you get stuck, you can always ask a neighbor to help you out. Computer scientists work together all the time to help each other find and fix bugs in their code. Make the trail appear only when the mouse button is held down using an if/then and mouse down block. Clear the screen using a clear block. Add a when green flag clicked block. 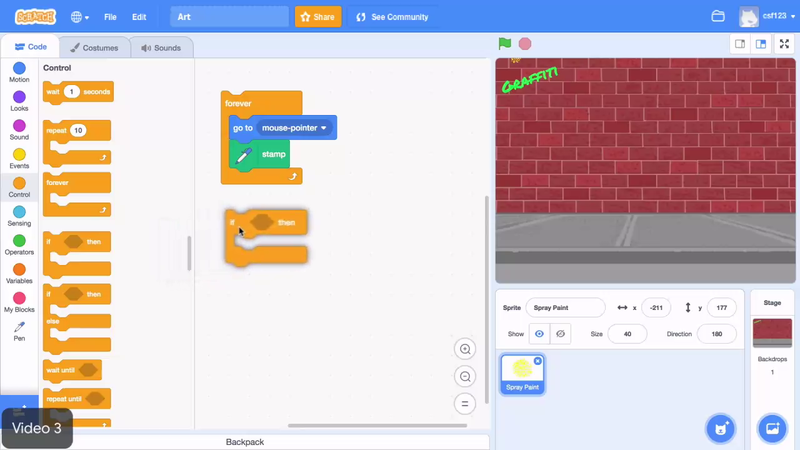 Use an "if-then" block to make the sprite stamp only when the mouse is clicked. Make the screen clear when the code is started. Add a "when green flag clicked" block to the code.